Americans widely believe that men have a better shot at leadership positions in business and politics, even as majorities say that men and women make equally good leaders. There is little consensus, however, on why women remain underrepresented in these fields. 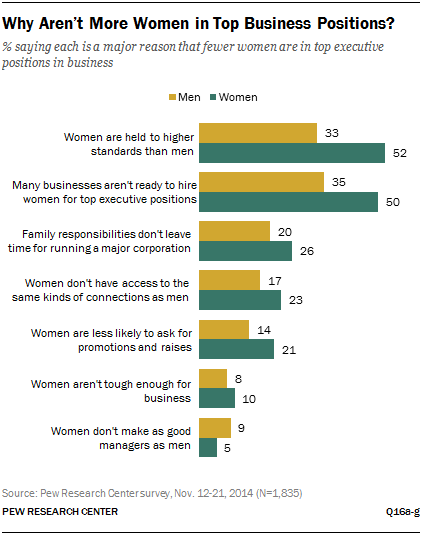 About four-in-ten believe higher standards for women and lack of readiness by companies to hire women for top positions and by voters to elect women to higher office are major reasons that there aren’t more women in top leadership roles in business and politics. Other reasons, such as family responsibilities, inexperience, or women not being tough enough, are cited less frequently as significant barriers to female leadership. The public expresses some skepticism about whether women will be able to overcome the obstacles that keep them out of top leadership positions, at least in business. About half (53%) don’t think women will achieve parity with men in top executive business positions in the foreseeable future; 44% say that as more women move into management roles, it’s only a matter of time before there are as many women as men in top corporate leadership positions. Do Women Have an Equal Shot at Top Leadership Positions? About two-thirds of Americans, including majorities of men and women alike, say it is easier for men than women to get elected to high political offices and to get top executive positions in business, but women are more likely to express this view. About three-quarters of women say men have a better shot at these roles, compared with about six-in-ten men, a pattern that is repeated across generations. 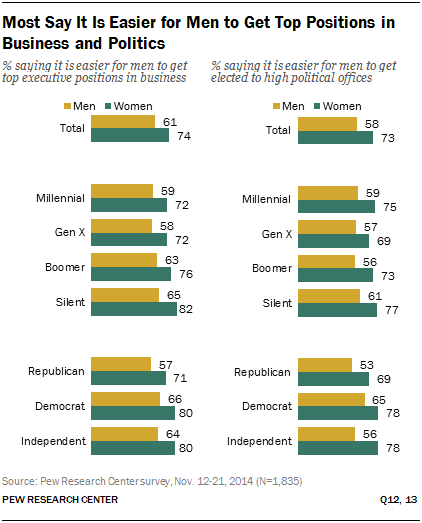 For example, Millennial and Boomer women are 13 percentage points more likely than their male counterparts to say it is easier for men to get top executive positions in business; there is a 14-point gender gap among Gen Xers and a 17-point gap among the Silent generation on this question. Similarly, there are double-digit gender gaps across generations on views that it is easier for men to get elected to high political offices. Across party lines, majorities say men have an advantage when it comes to getting top executive jobs in business and being elected to high political offices, but Democratic, Republican and independent women are considerably more likely than men in their respective groups to say this is the case. About eight-in-ten Democratic and independent women and seven-in-ten Republican women say it is easier for men to get top positions in business and politics, at least 13 percentage points higher than the share of men in the corresponding groups. If Americans think men and women make equally good political and business leaders but say men have an advantage when it comes to getting top positions in these realms, what do they think is holding women back? While there is no clear consensus, about four-in-ten (38%) say a major factor is that women who run for office are held to higher standards than men and need to do more to prove themselves. About an equal share (37%) say many Americans aren’t ready to elect a woman to higher office, and 27% say women who are active in party politics get less support from party leaders. 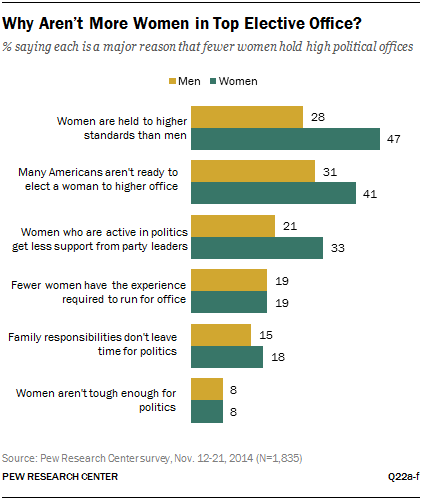 Still, at least a third say these are not reasons that there aren’t more women in high political offices. Women are generally more inclined than men to see higher expectations, voter hesitation and lack of institutional support as major obstacles to female political leadership. Fully 47% of women believe women who run for office are held to higher standards and have to do more to prove themselves, compared with 28% of men who see this as a major reason that more women are not in top elective office. Across generations, women are more likely than men to say that uneven expectations are a major obstacle to female political leadership. The gap is particularly pronounced among Baby Boomers; Boomer women are about twice as likely as Boomer men to offer this view (52% vs. 25%). By double digits, women are also more likely than men to say that voters not being ready to elect a woman to higher office and party leaders giving less support to women (41% vs. 31% and 33% vs. 21%, respectively) are significant obstacles to female political leadership. Gender gaps on these factors are not as consistent across generations. 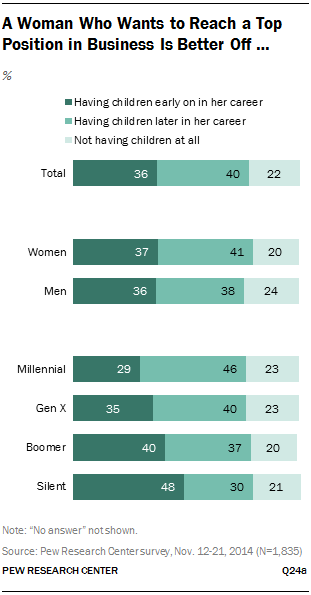 For example, the views of Millennial and Silent women and men don’t differ significantly on either measure, while Gen X and Boomer women are more likely than men in their generations to say each of these is a major barrier. Men and women alike reject the idea that women aren’t tough enough for politics; 73% of women and 72% of men say this is not a reason that there aren’t more women in top elective office. 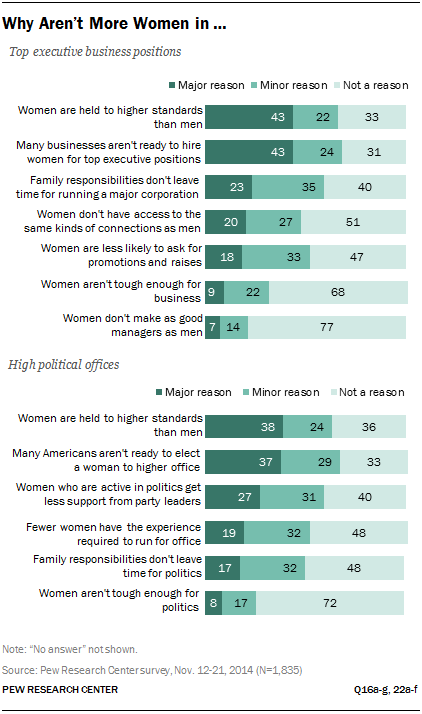 About half (48% of women and 49% of men) also say that family responsibilities are not a barrier for political leadership, but about as many say this is at least a minor obstacle. As with factors that hinder women’s political leadership, there is little agreement on the major barriers to female business leadership, although majorities of Americans – men and women alike – don’t think a lack of toughness or management skills are keeping women from reaching top executive positions. Uneven expectations and companies not being ready to elevate women are cited more than any other factor as a major reason that more women are not in top leadership roles in business. About four-in-ten cite as significant barriers that women are held to higher standards than men and that many businesses aren’t ready to hire women for top executive positions (43% each). But in both cases, at least three-in-ten say these are not factors holding women back (33% and 31%, respectively). On almost every factor tested, women and men offer different views about significant obstacles to female leadership in business. The gap is particularly wide on matters related to unfair expectations and hesitation to hire women. About half of women (52%) say a major reason more women are not in top leadership positions in business is that women are held to higher standards and have to do more to prove themselves; one-third of men share this view. Similarly, 50% of women say many businesses aren’t ready to hire women for these positions, compared with 35% of men who believe this is a major obstacle to female leadership. Women in the Millennial, Gen X and Boomer generations are more likely than men to say these are key reasons that there aren’t more women business leaders. Is Family an Obstacle for Female Leaders? Four-in-ten Americans do not believe that women’s responsibilities to family stand in the way of them becoming top business executives, but about a quarter (23%) say this is a major reason and an additional 35% say it is at least a minor reason that more women are not running large businesses. Women are somewhat more likely than men to see family responsibilities as a significant barrier for women hoping to reach the top levels of corporate leadership; 26% of women and 20% of men say this is a major reason that more women are not in top executive business positions. When asked if it’s better for a woman who wants to reach a top executive position in business to have children early on in her career, to wait until she is well established in her career to have children, or to not have children at all, Americans are divided: 40% say it is better to wait, and 36% say it is better to have children early on. About one-in-five (22%) say a woman with top business leadership aspirations is better off not having children. Men and women offer similar opinions about when women who want to reach a top executive positon should have children, but there is a considerable generation gap on this matter. In particular, Millennials are far more likely than members of the Silent generation to say women who want to reach the highest levels of business leadership are better off waiting until they are well established in their careers. Among Millennials 46% say it is better to wait and 29% say it is better for women to have children early on in their careers. In contrast, 30% of Silents say women who want a top executive position in business should wait to have children, and 48% say they are better off having children early on. About one-in-five in each generation say women who want leadership positions in business are better off not having children at all. Among Silents, opinions differ widely between men and women. Among Silent women, 54% believe it is better for a woman who wants to reach a top executive position in business to have children early in her career, while 30% say it is better to wait and 15% say it would be better not to have children at all. Four-in-ten Silent men say it is better for women who aspire to top business positions to have children early on. About an equal share say women should wait until they are more established in their careers (30%) as say they should not have children at all (29%). Americans are divided about prospects for the future of female business leadership, but more offer a pessimistic view than one that is optimistic. Overall, 53% believe men will continue to hold more top executive positions in business, even as more women move into management roles; 44% believe that as more women move into management, it is only a matter of time before there are as many women as men in top business leadership positions. Men and women express nearly identical views. Members of the Baby Boom and Silent generations are particularly skeptical about the future of female business leadership. 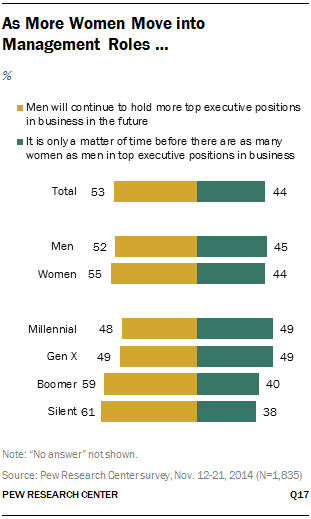 About six-in-ten Boomers (59%) and Silents (61%) believe men will continue to hold more top executive positions in the foreseeable future. Millennials and Gen Xers are equally divided between those who believe men will continue to dominate business leadership positions and those who say it is only a matter of time before there is gender parity. 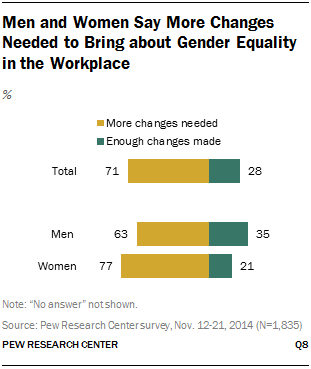 About seven-in-ten Americans (71%) say the country needs to continue to make changes to give men and women equality in the workplace; 28% believe the country has made the necessary changes. The view that the country needs to continue making changes to achieve gender equality in the workplace is particularly common among women; 77% say this, compared with 63% of men. The gender gap is especially pronounced among Republicans and among those with at least some college education. While 66% of Republican women say more changes are needed to achieve equality, less than half (45%) of Republican men agree. Among those with a college degree, 81% of women say the country needs to continue making changes to give men and women equality in the workplace, compared with 60% of men. Similarly, while 78% of women with some college education say more changes are needed, 57% of men with the same level of education agree. Thinking more broadly about society, only 13% say women currently face a lot of discrimination, with an additional 44% saying women face some discrimination. By comparison, 28% say there is a lot of discrimination against gays and lesbians in our society today, and about one-in-five see the same level of discrimination against African Americans (21%) and Hispanics (19%). Nearly two-thirds of women (65%) say there is a lot of (15%) or some (50%) discrimination against women in our society today. Men, however, are nearly evenly divided: 48% say women face at least some discrimination, while 51% believe there is only a little or no bias against women. This gender gap is evident across generations, with double-digit gaps between Millennial men and women (11 percentage points), Gen X men and women (17 points), Boomer men and women (20 points) and men and women from the Silent generation (21 points) who say women face at least some discrimination. There is also a partisan gap on perceptions of gender discrimination, with Democrats far more likely than Republicans and independents to see biases against women. 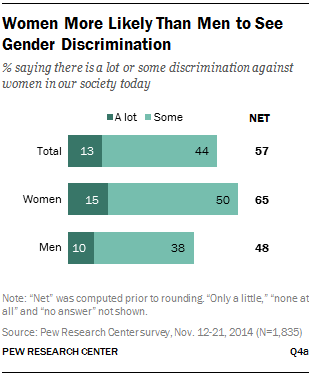 About seven-in-ten Democrats say women face a lot of (21%) or some (50%) discrimination. In contrast, just 4% of Republicans and 8% of independents say discrimination against women is widespread; 36% and 42%, respectively, say women face some discrimination. Within each political group, women are more likely than men to say society discriminates against women, a view that is most widespread among Democratic women; 79% say women face at least some discrimination, compared with 47% of Republican and 57% of independent women. Among men, 62% of Democrats, 32% of Republicans and 44% of independents share this view. It is worth noting that gender and partisan gaps are also evident in perceptions of discrimination against gays and lesbians, African Americans and Hispanics. In each case, women and Democrats are more likely to say the group faces discrimination.